Take a taste of California with you wherever you go and cover up your swimwear with one of these easy jumpsuits by Becca. 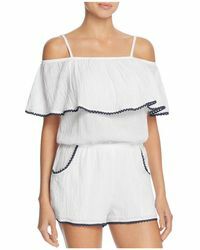 Designed for an effortless poolside look, this set of playsuits from the Orange County-based label is both feminine and contemporary. The range features cinched-in waists and a pared-back colour palette designed to slot easily into your vacation kit. Lightweight and roomy, a jumpsuit from Becca is a great option to travel in too.